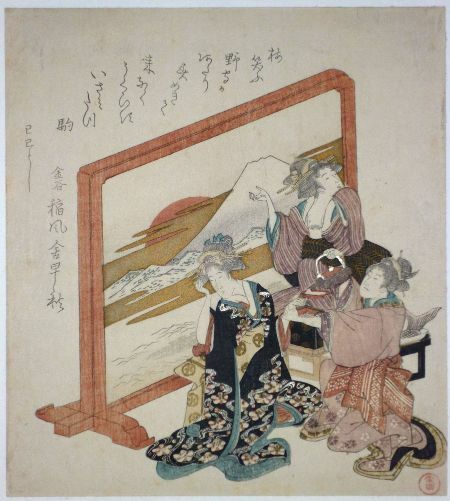 A rare surimono showing new year festivities before a large screen depicting Mount Fuji at sunset. A versatile and highly talented artist working in various mediums, Shunman produced (and cut and printed) some of the finest surimono. Published c 1810s. I cannot, at the moment, locate another impression. Fine impression and colour with extensive gold and silver. Fine condition. Sealed Shunman bottom right. Fine impression and colour with silver and gold. Light backing, otherwise very good condition. Signed Shokyuko Shuntei ga.